What an amazing difference i see in him. He enjoys it, his skin has not looked red or spotty or scabbed in months all white and healthy. For years and years it has been a constant battle getting our dogs diet correct. He is a furbaby with a sensitive tummy, allergies, itchy skin, from time to time his skin would flare up down to allergies (we were unanware of what his allergies were) and he bites, licks n ends up all red and sore. I have had to stop alot of treats as he may have been allergic to ingredients in them (even the “natural” ones) he is 9 years old now and i want nothing more than him to be happy and comfortable as he gets into his older years, and have the best wee life he has left. I was desperate. I tried all the grain free options, higher meat content, less derivative foods, exhausted all options. He remained relentless at nibbling and biting himself and making himself all sore. He also now has an enlarged heart as well as heart disease and is on medication for these. Another problem he gets through diet is bum/intestine issues giving diarrhoea and sometimes he would be caught short indoors down to colitis. I have always managed to maintain a healthy weight for him and i am very strict on anything he eats now because of the effects it can have on his skin and/or tummy. He is now onto his 4th bag. 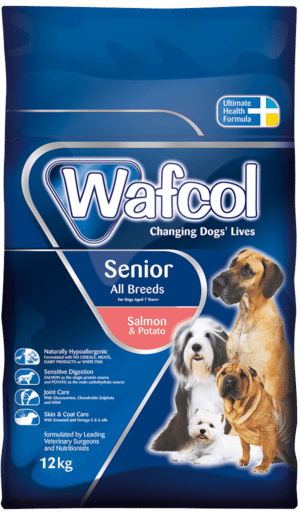 Wafcol is aimed at dogs with everything that solo has, it has no cereals, meats, dairy products or white fish. It helps aid sensitive digestion using salmon as the single fish protein source and potato as carbs. It includes ingredients for joint care and skin and coat care. Its hypoallergenic, it doesn’t contain any of the main things that dogs can be allergic to. RESULT: What an amazing difference i see in him. He enjoys it, his skin has not looked red or spotty or scabbed in months all white and healthy. His poos are good n no accidents at home. His weight is still great. Even his coat is lovely. It is pretty reasonably priced and i can get online at moment or locally if i order to pet shop. I share this because if there’s anyone who has a pooch with the same issues i know how frustrating it can be n its so unfair on them! So its worth a shot it has been fabulous for my wee guy!